Wal-Mart is eliminating health benefits for about 30,000 employees to control its rising health care costs. The cut applies to part-timers who work fewer than 30 hours a week -- about 2% of the company's U.S. workforce. More of Wal-Mart's employees signed up for health benefits this year than the company expected, which boosted the company's costs. One reason for the increase in sign-ups could be Obamacare, which requires most everyone to have health coverage, though Wal-Mart did not make that connection. Employees who lost the Wal-Mart coverage option would now be eligible for government subsidies on Obamacare exchanges. That could work out to a better deal, especially for lower-paid employees. Those who remain eligible for company coverage will see premiums rise. The cheapest and most popular Wal-Mart plan is increasing $3.50 to $21.90 per paycheck. "This year, the expenses were significant and led us to make some tough decisions as we begin our annual enrollment," wrote Wal-Mart executive Sally Welborn in a blog post. In August, the company said the increased enrollment led to a $500 million jump in health care costs compared to last year. 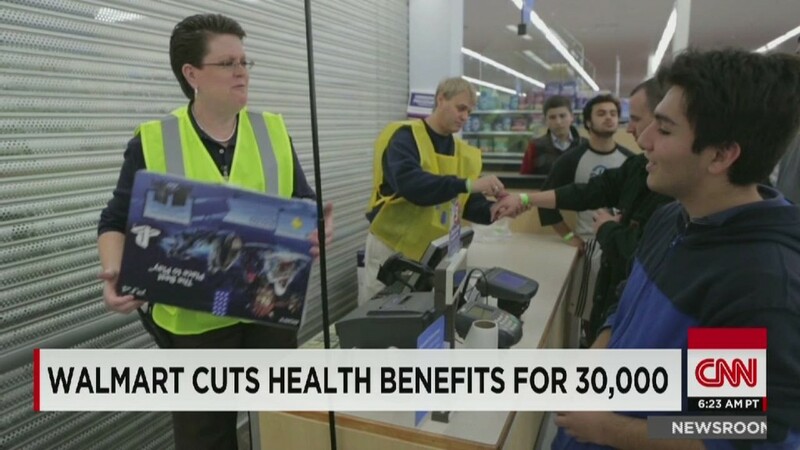 Wal-Mart (WMT) is not the first company to trim health benefits in the wake of Obamacare's roll out. Rival Target (TGT) announced in January that it was eliminating benefits for all part-time workers. It encouraged those employees to enroll in Obamacare and gave a $500 cash payment to each of them. Home Depot (HD) and Trader Joe's announced last year that they would stop offering coverage to part-timers. A Wal-Mart spokeswoman said the company will not limit the hours employees work as a result of the benefits change.